A lot of users typically use their computer to surf and web and if you're even reading this site, to download software. Unfortunately, many users become victims of malware attacks and their system may be modified, even after a cleanup. Sometimes a simple antivirus program and a reboot just doesn't repair the state a malicious program has left your system in. 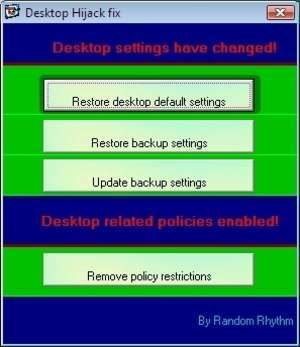 What Desktop Hijack Fix does is provide users with an easier way to restore their desktop and Windows settings to a more usable state. Version 1.4.2 is a freeware program which does not have restrictions and it's free so it doesn't cost anything. For security reasons, you should also check out the Desktop Hijack Fix download at LO4D.com which includes virus and malware tests. Additional screenshots of this application download may be available, too.